Wonderful looking collection of essays edited by Thomas F.X. 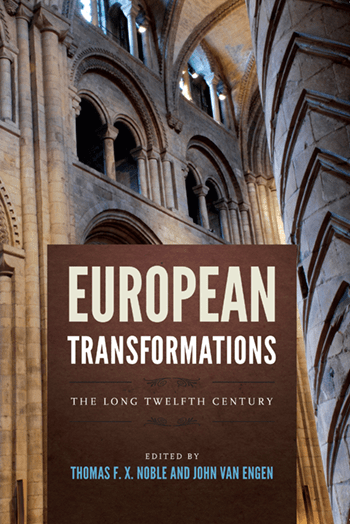 Noble and John Van Engen (both of Notre Dame), European Transformations: The Long Twelfth Century (Notre Dame 2012). The publisher’s description follows. The “long twelfth century”—1050 to 1215—embraces one of the transformative moments in European history: the point, for some, at which Europe first truly became “Europe.” Historians have used the terms “renaissance,” “reformation,” and “revolution” to account for the dynamism of intellectual, religious, and structural renewal manifest across schools, monasteries, courts, and churches. Complicating the story, more recent historical work has highlighted manifestations of social crisis and oppression. In European Transformations: The Long Twelfth Century, nineteen accomplished medievalists examine this pivotal era under the rubric of “transformation”: a time of epoch-making change both good and ill, a release of social and cultural energies that proved innovative and yet continuous with the past. Their collective reappraisal, although acknowledging insights gained from over a century of scholarship, fruitfully adjusts the questions and alters the accents. In addition to covering such standard regions as England and France, and such standard topics as feudalism and investiture, the contributors also address Scandinavia, Iberia, and Eastern Europe, women’s roles in medieval society, Jewish and Muslim communities, law and politics, and the complexities of urban and rural situations. With their diverse and challenging contributions, the authors offer a new point of departure for students and scholars attempting to grasp the dynamic puzzle of twelfth-century Europe.